A stone outside of Borgarnes, Iceland still bears markings of the hammer that hit it 1,000 years ago. The anvil stone is one of the final surviving possessions of a legendary Viking blacksmith named Skallagrim, who made tools, weapons, and ship rivets from iron. Heredia and her team are bringing that story to life. In a project for Design 384: Interdisciplinary Design Projects, they are recreating the iron forge that accompanied the anvil. Their Icelandic client, who now owns Skallagrim’s land, envisions using the forge to provide visitors with demonstrations of tool making and a taste of 9th century Viking life. 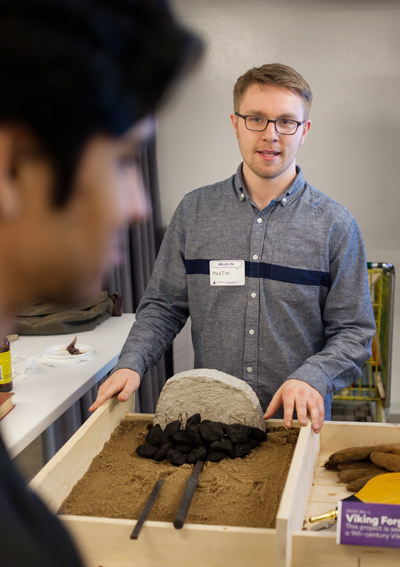 The team’s model of the Icelandic forge was one of the projects on display at the Segal Design Institute’s Design Expo, held on Friday March 11 and Saturday, March 12. The annual, two-day showcase event featured portfolios and projects by undergraduate and graduate students from several of Segal’s programs, including the Segal Certificate Program, bachelor’s degree in Manufacturing and Design Engineering, master’s degree in Engineering Design and Innovation, and Design Thinking and Communication course. For students who don’t yet have plans for after graduation, the expo provided an opportunity to meet with representatives from some top Chicago-area design companies. Faculty and students also circulated the event to view projects and ask questions. Other displayed projects included tools for cleaning the Shedd Aquarium’s tanks, solutions for patients at the Rehabilitation Institute of Chicago, and CrowdCheer, an app that leverages existing crowds to deliver targeted encouragement to runners.